One of our customers wanted to have an internal notification system where employees can leave questions or complaints. 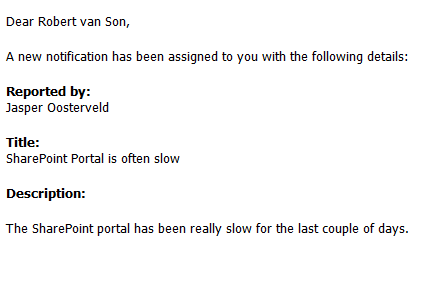 This can vary from potholes in the parking lot to notifying the IT administrator about the speed of the SharePoint portal. Setting up this system would be perfect for InfoPath. You can create a form with multiple views and use the out-of-the-box rules and conditions. 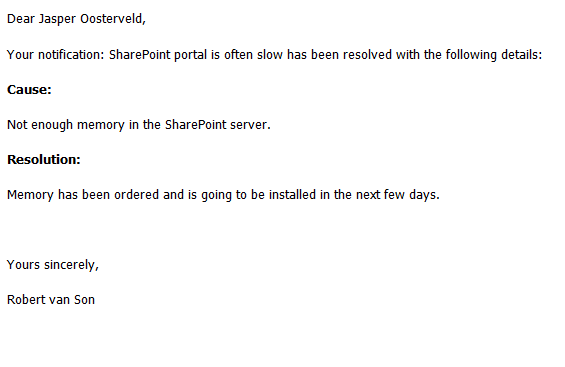 Only this customer does not have the SharePoint Enterprise Edition or InfoPath. This meant I had to get creative and dive into SharePoint Designer. 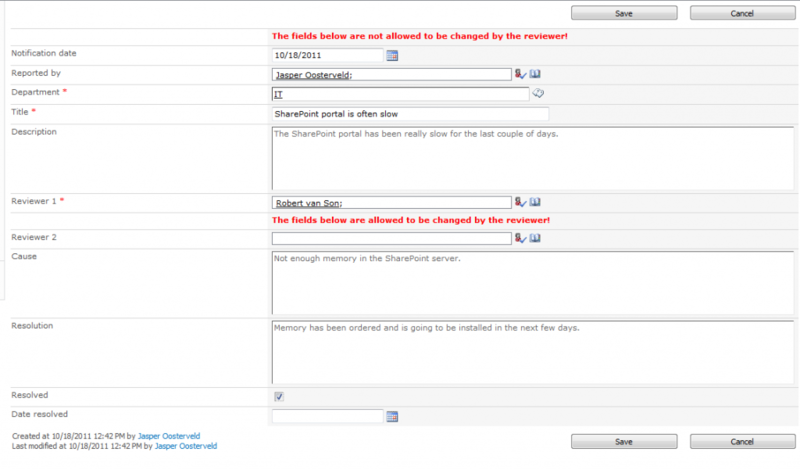 I worked a lot with SharePoint Designer but never really with data view webparts, creating custom views and pages. The solution I created is not perfect but I think it is a pretty good workaround by just using the SharePoint out-of-the-box functionalities. Any developer can use this solution and add script or code to fill in the OOTB gaps. In this first part of the series I want to show you the solution and in the next part I will explain how I configured the solution. Jasper can see that his notification has been resolved! 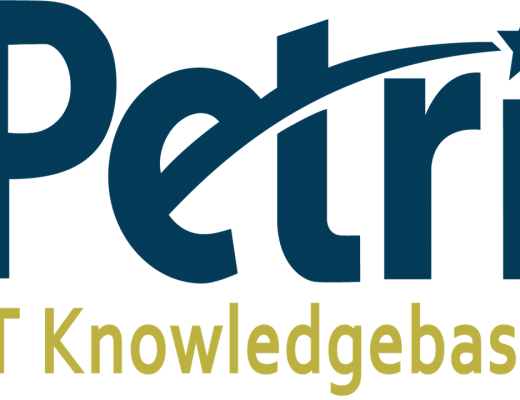 This page also serves as an archive to every user. I would like to set the employee notification fields at read only when the reviewer edits the notification. In theory the reviewer can change the entered information. The employee can of course see this in the My Notification page but you would like to prevent this. I created twee new edit forms, one for the employee and one for the reviewer. The employee should only see the employee fields and vice versa. 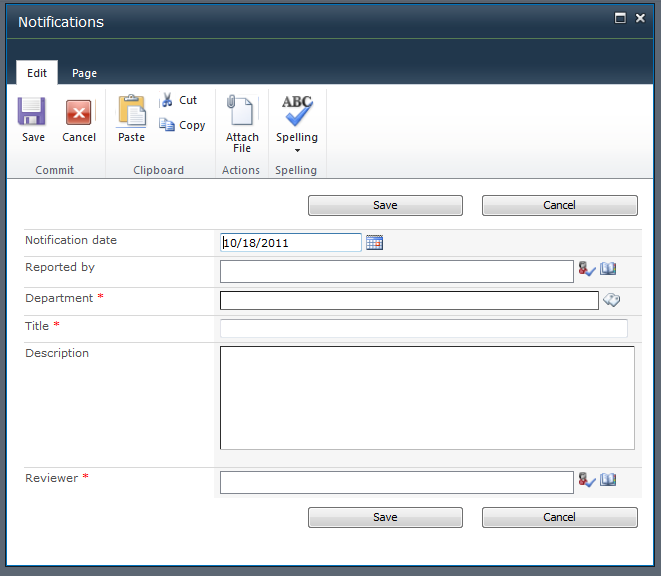 The edit menu for the reviewer is also accessible for the employee through the edit menu. This solution has the procedure that the employee is not allowed to change the notification. There is also no workflow in place to support this. It would only be cleaner to not show the reviewers edit menu to the employee. The My notification and My Reviews pages do not contain a quick launch. I am not a designer but I am sure that can easily be resolved. Again, I realize this is not perfect but I hope you get some inspiration from this solution and maybe alter it to your business needs.